You’ll be up and working in no time with Chimp Rewriter’s familiar interface that looks and feels the same as almost every professional application. Everything it does is lightning fast so you can work incredibly efficiently to rewrite and spin articles in record time. 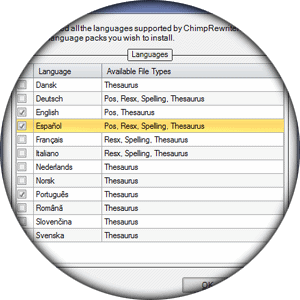 The Chimp Rewriter automatic rewriting engine is built around Natural Language Processing research funded by university and massive international companies. In human-speak, this means Chimp uses artificial intelligence and smart cross-checking to ensure your articles make sense to real people. Build multimedia rich documents in seconds with automatic tools to fetch articles, videos and image and mix them together into a highly unique article to call your own. Run grammar checks and analyze metrics like word density and LSI to create the perfect article for both humans and search engines. We know you want the article rewriting experience to be as fast as possible. With more than 10 one-click tools, rewriting and spinning has never been faster. 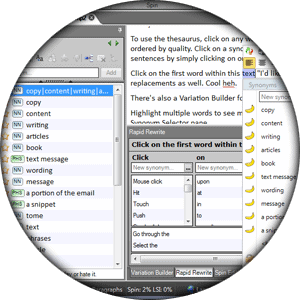 Intelligent rewrites, favourite spin, remove all original words for improved uniqueness, reorder or combine sentences and paragraphs, compare results and copyscape check all with one click. Add variations in a way that you prefer. 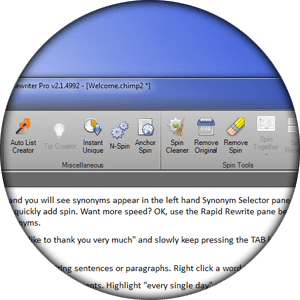 With a host of synonym/phrase selectors, sentence and paragraph builders, keyboard shortcuts and highlighting of sections that need attention, adding manual variations is fun, flexible and fast. Chimp Rewriter contains everything you would expect from a top notch article spinner and article rewriter in one. 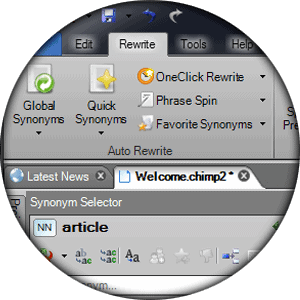 Learning from the way you spin and rewrite, Chimp Rewriter always provides the best synonyms for your style. 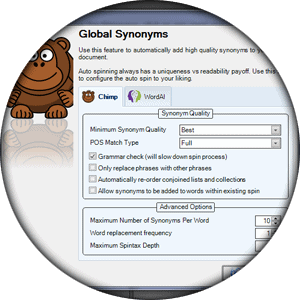 Build custom global and niche-based thesauri, protect terms from being rewritten, add favorites synonyms and delete the ones you don’t like. Point Chimp at your old articles with spintax and it will learn from them as well. You have full control. For those who are serious about article spinning and rewriting, Chimp Rewriter includes many advanced tools to add huge dimensions of uniqueness for the ultimate results. 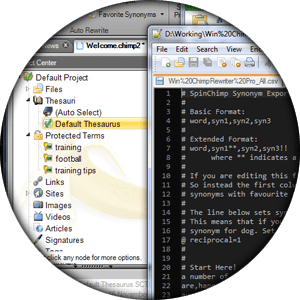 These include tip article creation, N-spin (creates huge permutations from word groups), anchor text spin, random ordering & anchoring, bulk directory rewrites, list reordering and more. Once you are done with the rewriting, you can export your content into any format you need. Choose the spin syntax, the text formatting (e.g. HTML), automatically add signatures and use mail-merge style tags. 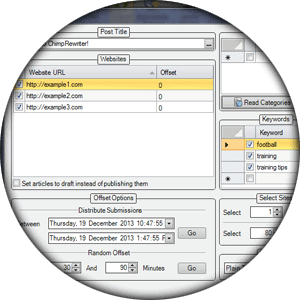 There’s also a powerful blog submitter where you can trickle your article out to hundreds of websites with one click. The main interface supports almost any language. There are built in thesauri for English, Spanish, German, Italian, French, Danish, Dutch, Norwegian, Portuguese, Romanian, Slovenian, Swedish. These are always improving. 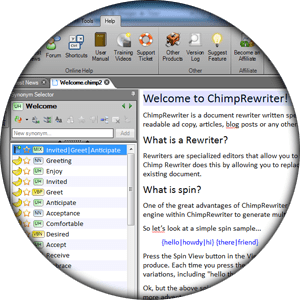 The Chimp Rewriter API has been integrated in all major content creation suites and SEO tools including WP Robot, RankWyz, Ultimate Demon, SEO Content Machine, GSA Search Engine Ranker, Kontent Machine and more.